LG has sent us a little note about an interesting campaign that they are starting called "To Me, You Are Perfect". The campaign runs from now up until August 6th, the day before LG holds an international media event ostensibly to introduce the LG G2. We have had a number of leaks about this phone, including a recently discovered video about the unit. With a unique design that includes a volume rocker on the rear plate, this highly spec'd device could be strong enough to play in the same Android sandbox with the Samsung Galaxy S4, HTC One and the Sony Xperia Z. The new LG promotion has been designed to show LG customers how they have inspired the company. To participate, send a picture or a video message that you have addressed to a loved one, to one or more of LG's online channels. These would include LG Mobile’s microsite (www.LGMobile.com), Facebook page (www.facebook.com/LGMobile) or YouTube channel (www.youtube.com/LGMobile). 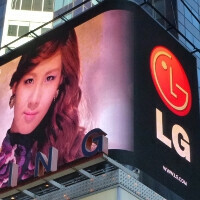 Selected videos will play on those channels as well as on LG's huge billboards in New York's Times Square and London’s Piccadilly Circus. The winner with the largest number of views and 'likes' will receive a prize valued at $5000 USD. Forty randomly selected entrants will receive a free LG Series G handset and 500 will receive a LG Pocket Photo Printer. Better start working on your message now since the contest ends in about three weeks. Yeah LG, you should think about your customers first.